An Enduring Power of Attorney is a ‘just in case’ document allowing you to appoint control of your personal and financial affairs to somebody you trust if there comes a time you cannot make these decisions yourself. Losing your mental capacity is defined as losing the ability to make your own decisions, financial and/or personal. You can lose your capacity in a number of different ways whether it is through stroke, learning disability or through a range of mental illnesses. Let’s take dementia, for example, this is one mental illness that most people would have either a level of understanding of or experience with. There is no age limit of dementia; there have been cases of people in the 30s, 40s and 50s having being diagnosed with dementia. In fact, one in 10 people diagnosed with dementia are under the age of 65. According to the HSE, it is estimated that 55,000 people in Ireland are living with dementia and over half a million of us have a family member with dementia. The statistics are startling; 4,000 people develop dementia each year, this equates to approximately 11 people every day. One way you can ensure that their personal care decisions and financial decisions are carried out as you wish, should you lose your capacity, is by putting in place an Enduring Power of Attorney. Understand | What is an Enduring Power of Attorney? This is a ‘just in case’ document by which you appoint another person or people to act on your behalf to make your personal care decisions and financial decision for you if you can no longer make your own decision for yourself. The person who makes the EPA is called the ‘Donor’ and the person that is appointed to deal with their affairs on their behalf is called the ‘Attorney’. It has no effect until the Donor has lost their mental capacity. To prove the person has lost their mental capacity the Donor must be given a medical diagnosis. Once diagnosed as having lost their mental capacity, there is a registration process that must be undertaken before the the EPA can be activated and the Attorney can then proceed to deal with the Donor’s affairs on their behalf and as they wished. In some cases, mental capacity can be lost for a short period, for example in the event of a coma. In this case, the Enduring Power of Attorney can be activated and should the Donor awake from their coma and regain their mental capacity it can be cancelled by the Court. When should I set one up? It can be put in place at any time. It is advisable to have one in place as early as you can. In the event, that an accident or illness suddenly takes over and a person cannot make their own decisions it may be too late to put an EPA in place. The best advice is to set one up when you are healthy and have the mental capacity to do so. It can be made by any person over the age of 18 who has mental capacity. It is important to note that if you do not hold any financial assets, your Enduring Power of Attorney can still deal with your personal care decisions. What does losing mental capacity mean? We advise that you seek medical attention if you are worried about yours or a loved one’s ability to make their own decisions as you may need to start considering an EPA. Decide | What powers you will give your Attorneys? It is important to carefully choose the level of decision-making power you give your ‘Attorney(s)’ as the EPA can cover both your personal and financial decisions. housing, social welfare and other benefits for the person. This is an important step in making an Enduring Power of Attorney as you are handing over a significant amount of responsibility to the person(s) you choose. Usually, the people appointed to make your personal and financial affairs are your next of kin. It can be of benefit to appoint more than one Attorney. Who are your attorneys? Are they your next of kin, family member, friends and do you trust them? How will they work together? Is there anything that may stop them from making a joint decision? Are there any restrictions you might want to put on your attorneys with regards certain decisions? Do your attorneys understand how you would like them to make decisions for you? How should my Attorneys act – jointly or separately? If you appoint more than one Attorney to act on your behalf then you must make a decision as to how they will make decisions, i.e. can they make decisions independently, separate from each other or must they make decisions together. In this scenario, Attorneys cannot make decisions independently and must make your personal and financial care decisions together. This is often chosen to ensure that your decisions are made for you in your best interest. All decisions must be unanimous and where documentation is involved they must all sign. Often referred to as ‘jointly and severally’, in this option attorneys can make decisions jointly as well as independently from each other. This option does harbour some benefits, i.e. it is more flexible, urgent decisions can be made quickly for you and if one attorney cannot act or dies then your EPA will continue without the need for a substitute Attorney. Do Attorneys get paid to take care of my decisions? In general, attorneys do not get paid to handle your personal or financial affairs. However, you can make provision in your Enduring Power of Attorney for your Attorneys to be financially compensated if you wish. It is quite uncommon for remuneration to be provided for, particularly when next of kin are appointed as Attorneys. Who are your notice parties? You must inform your Attorneys of the responsibility you will give to them and you are also obliged to notify two other people of the fact that you have made one. The other two people you notify are called your ‘Notice Parties’. If you do not have a spouse, civil partner or child then you must choose two relatives to be your Notice Parties. Your Notice Parties are then notified again if the EPA needs to be actioned. Creating an EPA is a quick and easy process and will leave you with peace of mind, knowing that your personal and financial care decisions will be taken care of should you lose your capacity. Name and address of your chosen attorneys and substitute attorneys where applicable. Details of your financial/personal care instructions. If you do not know all this information or not sure about what you might need, do not worry, this is what we are here for as your solicitor, to talk you through all this and make the process as simple as possible. This one document when correctly put in place offers great peace of mind for you and your loved ones. If you do not have one and lose your ability to make your own decisions you will be deemed ward of court. The wardship process is complex and costly and is completely avoidable by simple creating an Enduring Power of Attorney. 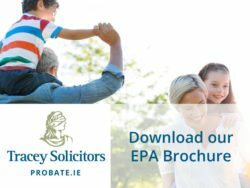 For more information on what you need to do and how quickly you can put one in place talk to us first by calling 01 649 9900 or emailing probate@traceysolicitors.ie and we would be delighted to assist you. John was showing indications of Alzheimer’s and his family were getting worried. John’s wife passed away a few years previous and he had one surviving son. They decided to put an enduring power of attorney in place, just in case John was to lose his capacity to make his own decisions. With the help of a solicitor, John created his EPA notified his brother and sister of this and made his son the attorney. Shortly after this, John lost his capacity to make his own decisions and was admitted to a nursing home for specialist care. While in a nursing home, John’s house was let out to generate a source of income to cover the costs of the nursing home, Unfortunately, there was a fire in the property which was caused by the tenant. At this point, the property became a burden and the decision to sell the property was made. As John did not have the capacity to make this decision himself, the decision was made by his attorney, to do this the EPA has to be invoked. Without an EPA John would have become Ward of Court and the process of selling the property and ensuring that John was looked after the way he wanted would have been a stressful and lengthy process. John remained in the nursing home for 5 more years.